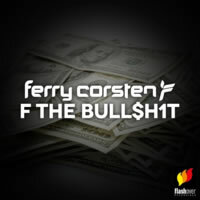 Ferry Corsten says what we're all thinking. Ferry Corsten doesn't need to listen to the critics. He follows his own path. He makes the kind of music he wants to, and ain't nobody gonna stand in his way! And how does he vocally express his attitude toward all those naysayers who think he's past his prime or that his music stinks like a freshly stacked manure pile? "F The Bull$h1t!" That's right! He even screams a number and a dollar sign in your face! He's THAT serious! F The Bull$h1t (which is actually the name of the track, if you hadn't already picked up on that) comes in only one flavour: Original Mix. No extra crispy on this chicken wing. Starting off with some rhythmic claps to get us all hyped before delivering that wonderfully-crafted title phrase. With bass and beats combined, Ferry leads us into darker than usual territory, but it's still suitable for clubbing. In an unexpected turn after a couple of minutes, Ferry throws something else our way: a more heartfelt melodic blend of piano and synth that doesn't match the tone of the rest of the track (but is hardly unwelcome), all before returning to the darkness from whence we came. There's even a bit of the ol' 303 hiding out here for some acid trance memories. F The Bull$h1t's a pretty decent track — nothing absolutely phenomenal, but nothing that will cause dogs to sling their paws on the vinyl and stop the spin. It sounds rather mature and is suitable for a little later on when the chipper youth have all gone home to roost and you want a little more darkness in the night.